While travel is essential for small to medium businesses that want to expand their horizons, it’s not just travel that drives growth. According to SME travel management specialist Business Travel – innovation, technology and managing cashflow effectively also form part of the blueprint for business success. Corporate Traveller’s general manager, Jess Anscombe, said the company worked daily with SMEs that were increasing their business travel spend to maximise growth opportunities. However she said quite often they overlooked some of the other business strategies that were critical to success. “While our core business is helping SMEs with their travel planning and management, the process of developing a travel plan with business owners and managers sometimes highlights the growth strategies that haven’t been implemented. Travel activity needs to be supported by and integrated with other business strategies to really maximise growth,” Jess said. Using travel to broaden the company’s reach and presence – this can include roadshows by sales teams, attendance at overseas industry events, and face-to-face meetings with prospects and customers, all of which help breed familiarity and trust with the business and are absolutely necessary for any businesses wanting to expand into new states and countries. “Business Travel helps SMEs maximise the value in their business travel budgets by sourcing the best types of rates and fares for the company’s needs, making travel bookings more efficient, analysing expenditure and securing cost savings across the use of suppliers,” Jess said. 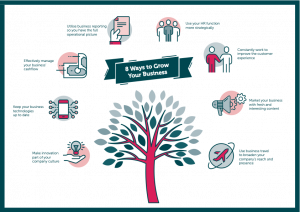 “We can help businesses accelerate their growth not only by making their business travel investment as effective as possible, but also by helping steer them towards the above strategies to ensure they’re taking a well-rounded approach that gives them the best chance of success.